With the introduction of the new supersyllabogram/ideogram TE “well prepared, ready” in the context of the logogram for  “wool”, the translations of these 5 tablets is pretty much straightforward. This is the first time we are confronted with a supersyllabogram inside an ideogram. There are many others. While the basic ideogram for “cloth” is blank, almost all others contain some syllabogram inside the ideogram. For instance, when the ideogram for “cloth” contains the sypersyllabogram TE inside it, the meaning of the ideogram is immediately altered to reflect the meaning of the entire word beginning with the syllabogram. Once again, Tselentis comes to the rescue. It just so happens that the one and only Linear B word beginning with TE in his Linear B Lexicon which can possibly apply to cloth is TETUKOWOA, alternately spelled TETUKOWOA. It means “well prepared” or “ready”. This fits almost like a glove with the logogram “cloth”. The further we delve into new supersyllabograms, the more their tentative translations are firmed up. Since we first tentatively deciphered the supersyllabograms KI = KITIMENA (plot of land), MA = MARE (wool), ONATO (lease field), NE (new or young), PA (lost sheep, recovered or found? - very doubtful), PE (enclosure, sheep pen) & ZA (this year) in the context of “wheat”, not “wool”, the evidence appears to be confirming the semantic values consonant with the context, where context is defined as a specific area of the Minoan/Mycenaean agri-economy, trade and artisanship etc., such as sheep raising and husbandry, the underpinning of their entire social fabric. Tablets focusing directly on sheep raising and husbandry account for over 700 or 20+ % of 3,000 Linear B tablets at Knossos, for which I compiled complete statistics. This is an enormous sampling (75 %) of all 4,000 tablets at Knossos, so its accuracy is probably within the range of less than + / -.05 %. All other areas of the Minoan/Mycenaean agri-economy, trade and artisanship etc. fall a distant second to sheep raising and husbandry, including shearing the sheep for wool! 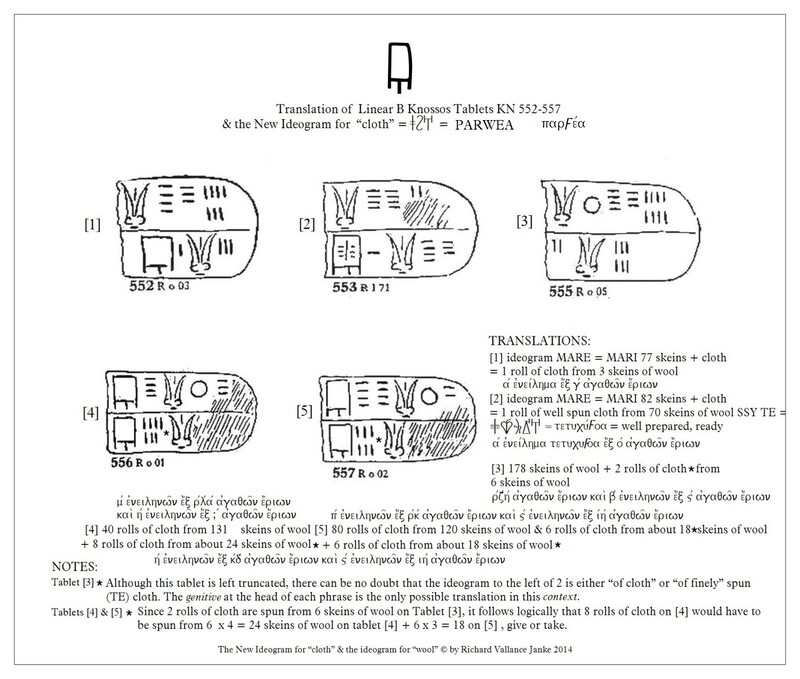 Since the supersyllabogram PE was spelled out as PERIQORO on just one Linear B tablet, we can be almost certain it means “enclosure or sheep pen”, regressively derived from the entry in Liddell & Scott, 1986,  pg. 547, for “periobolos” (which is the Greek spelling of this very word) = compassing, encircling, and more specifically an enclosure. Since Mycenaean Greek consists almost exclusively of denotative, concrete nouns, I believe we can safely derive the Mycenaean for this word as enclosure. Additionally, the further back one goes in the historical timeline of pretty much any language, the much more likely the concrete/abstract and abstract meanings of words devolve retrospectively into the concrete alone. It is but a small step from defining PERIQORO as “enclosure” to an even more remote definition “sheep pen”. This is precisely what I have done, in the confidence that the Mycenaean meaning of the word is highly likely to be “enclosure” and even “sheep pen.”  Reversing the historical process to the normal chronological timeline, we note that languages do in fact evolve from the purely concrete to concrete/semi-abstract and finally to concrete/semi-abstract/abstract. For ancient Greek, this process starts with the Mycenaean proto-Ionic dialect and continues unbroken through Arcado-Cypriot to Ionic to Attic Greek. In this process, languages have a strong tendency to abandon the very earliest concrete values in their vocabulary, and replace them with less specific concrete meanings, as for instance in the case of the putative original Mycenaean PERIQORO sheep pen & enclosure to the Attic, enclosure alone, sheep pen having vanished in the dark recesses of the distant past. However, nothing in this process detracts from the definite possibility, even probability that the original Mycenaean, PERIQORO, does mean “sheep pen”, especially in light of the fact that sheep raising and husbandry was at the core of Minoan/Mycenaean society. The remarkable preeminence of sheep husbandry simply serves to reinforce the notion that PERIQORO means, not only enclosure, but also sheep pen. There you have it, the justification for the conclusions I have reached. Now, taking my cue from the sypersyllabogram PE, I discovered, to my astonishment and delight, that the semantic values of the next 2 syllabograms I was able almost immediately to decipher, i.e. O, KI as ONATO (lease field), KITIMENA (plot of land), for the simple reason that (again) in the context of sheep husbandry alone, they practically leaped from Tselentis right in my face. Sure enough, when I came around to decipher almost 100 tablets with these 3 supersyllabograms, PE, O & KI, they all fit the context of sheep husbandry like a glove. Moreover, the Linear B scribes frequently used them in combination, 2 and even 3 together, so that, for instance, a tablet with all three of these SSYs (PE, O & KI) strung together in front of the ideogram for rams, ewes or sheep, still makes perfect sense. For example, O + KI + PE + 25 rams turns out to mean, “25 rams in a sheep pen (enclosure) on a leased plot of land”. Once the process of decipherment of syllabograms got up its steam, it swiftly yielded 16! more sypersyllabograms, of which we have either tentatively or pretty much firmly defined 12. And many more are yet to be investigated. I suspect that something like 25-30 syllabograms are also supersyllabograms! This startling discovery, if it ultimately proves to stand the test of further linguistic research, is nothing short of revolutionary where the decipherment of much of the remaining residue of Linear B which has defied decipherment to date. This is nothing short of amazing! It very much appears to confirm my hypothesis that Linear B is in large part shorthand, which makes it utterly unlike any other ancient script. Shorthand, as the Linear B scribes appear to have practised with gusto, did not resurface in such complexity until the 19th. century AD! None of this surprises me in the least, given the sophistication of Minoan/Mycenaean society. Take for example the fact that the Minoans at Knossos mastered the fundamentals of hydraulics to construct a water conservation and plumbing system that was never repeated in any ancient civilization, and did not resurface in such complexity until the end of the 19th. century (yet again!). What is going on here? I leave it to you to decide for yourself, but as far as I am concerned, the notion the commonly accepted notion that the Minoan/Mycenaean civilization during the extended period of dominance of Linear B (ca. 1450 – 1200 BCE) was prehistoric borders on the absurd. Flatly put, their civilization was not prehistoric, but proto-historic. And there lies a truly significant gap. It is but a small step from a proto-historic to a historic civilization.